The story is set in Australia. The fact that the Australian production house Slaughter FX released this film (in the past they also released “Charlie’s farm“) made me feel hopeful. Frankly, I think most Australian horrors are sublime anyway. Maybe it has something to do with that beautiful Australian accent. It makes me instantly happy. So you’ll hear the stop word “mate” regularly here. There was no indication that the Monroe family their holidays would turn into a real nightmare. Debbie (Simone Buchanan) and her American husband Bruce (Bill Moseley) are on their way to Debbie’s brother Bernie (Nathan Jones). Together with the rest of the family. If you already think that the size of the wild boar is going to be impressive, then you’ll certainly be impressed by Bernie’s height. What a giant. He looks like a kind of Obelix who likes to eat such a wild pig for breakfast. So I was looking forward to a “Clash of the Titans”. Apparently, Slaughter FX are fan of Nathan Jones because he was also allowed to take on the role of Charlie in “Charlie’s Farm“. It’s even mentioned briefly in this movie. Let’s talk about the subject: the gigantic wild boar. 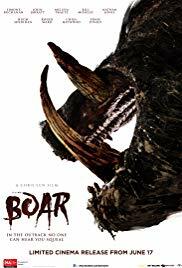 If you set up such a typical monster film as “Boar“, then you know in advance that you won’t get a phenomenal and astonishing story. The only thing that counts in such films is: how frightening and horrible is the huge monstrosity that kills so many innocent people and in what a horrible way they are slaughtered. The rest is secondary. Furthermore, you need to empty your head and don’t ask too many questions about the hows and why. Because it all remains a mystery. Is this wild boar so gigantic because of the consumption of large quantities of truffles or acorns? Or did it roll in a pool of chemically polluted mud? Was it a hunter shooting a load of lead in its buttocks after which the beast got so mad it took on such a grotesque form? Or is the beast coming from the underworld? I have no idea. But what you can say is that the creature does have some remarkable skills. It turns out to be an expert in camouflage because nobody has ever seen the monster roaming around. And I thought Australians were outdoorsy who are connected with nature and spend a lot of time in the bushes with the local wildlife. Furthermore, the boar has an ingenious GPS system because it always appears in the right place at the right time. The biggest disappointment, however, is the visualization of the creature. It’s clear they used a model for the close-ups. A kind of XL Muppet of the Muppetshow. And on rare occasions, the digital version is used. But those images are extremely bad. Only when you see the monstrous head with gigantic tusks full of mucus, blood, and mud this pig looks frightening. And you can expect a few bloody, gory slaughter scenes when this monster tears up his next prey.